Bottle Lake Forest Park, described as a “forest for all seasons”, has something for everyone – it’s a fantastic place to walk, run, and bike ride. You’ll even see people riding horses. 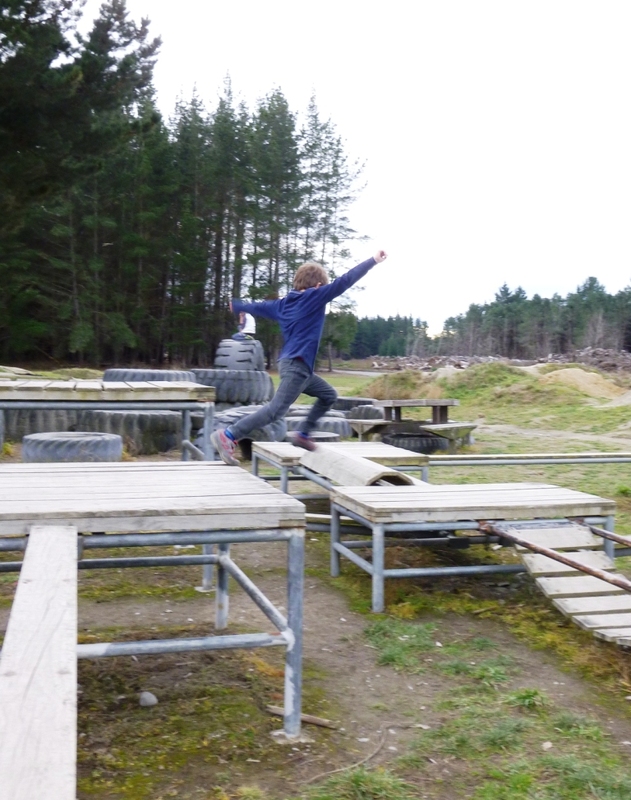 There’s an obstacle type course (I’m sure intended for dogs) that my kids love. For the more adventurous, there’s a bumpy BMX style dirt track kids can ride their bikes around. Great for remote control cars too. A lot of the forest at the start of the tracks has been felled but there are still many tracks to explore. There are long and short options to suit all ages and levels of fitness. Lots of paths are suitable for buggies and kids’ bike riding. Track surfaces range from hard packed soil and gravel to loose sandy sections and may change due to the weather and usage. Keep an eye out for bivouacs in the forest – great fun to add to and play in. Hunt for huhu beetles in old logs – eat one and freak the kids out! Last year, an “Orienteering Give it a Go Day” was held at Bottle Lake in February. This is a cool event to keep an eye out for. We visited Bottle Lake Forest in August 2015 (winter). There are brochures and maps in the Visitor Centre. The Visitor Centre (Waitikiri Drive entrance) has map boards and brochures for the park. Dogs are allowed in the park (unleashed) so be aware if your little ones don’t like dogs. Parking – there’s heaps close to the Visitor Centre but it can get busy. Toilets – there’s a block of toilets in the main car park area. There are one or two old picnic tables. Bottle Lake is a production forest so there may be “no-go” areas for safety reasons. There aren’t really any shops or cafes in walking distance – you may pass The Naked Baker on the way through and it’s not far from The Beach Cafe (which is also across the road from a pretty cool playground). Bottle Lake is is a production forest, and trees are felled and logged in a 30-year rotation. Developed from a farm in the early 1900s the forest expanded from coastal protection plantings to its present size. It is planted with mostly Pinus radiata and covers over 800 hectares of coastal sand dunes – that’s more than four times the size of Hagley Park. Agility course – perfect for kids and pooches! Bottle Lake Forest is about 10 km north-east of central Christchurch, in Burwood, adjacent to the coast. The main entrance and car park is off Waitikiri Drive, off Burwood Road, via either Marshlands or Burwood. There is also access from Spencer Park and from North Shore along the Southern Pegasus Bay track. Bottle Lake Forest Park – Christchurch City Council. This site a has a PDF brochure and map of the park and tracks. Bottle Lake Forest – On Your Bike. If you fancy a decent bike ride, check out this site.